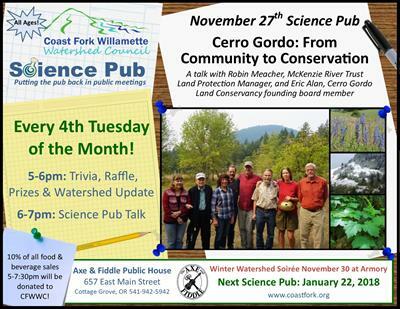 Cerro Gordo: From Community to Conservation presented by Robin Meacher, McKenzie River Trust Land Protection Manager and Eric Alan, Cerro Gordo Land Conservancy will be the focus of the November Science Pub. Working together these groups secured a conservation easement preserving 531 acres of the southern Willamette Valley’s meadows, oak woodland, riparian areas and conifer forest. The presentation will highlight Cerro Gordo’s special features of habitat and plant community and its vital role as an anchor for continuing conservation of the Row River drainage. Cerro Gordo’s path of community and conservation, from its 1974 purchase to its current conservation is a story that will truly inspire. The CFWWC hosts a family-friendly monthly public meeting series called the Coast Fork Science Pub on the fourth Tuesday of each month from 5-7pm at the Axe & Fiddle, 657 E. Main Street in Cottage Grove. The event begins with informal socializing, trivia, and updates about the watershed and watershed council during the first hour. The Science Pub presentation begins at 6pm. CFWWC receives 10% of all sales from the evening between 5-7:30pm. The event is free to the public, with a $5 donation suggested. For further information, visit Coast Fork Willamette Watershed Council on Facebook or www.coastfork.org. Photos (from left to right): Tall Bugbane by Ed Alverson, Prairie Lupine by Ed Alverson, Cerro Gordo Land Conservancy members by Eric Alan, Cerro Gordo landscape by Eric Alan.